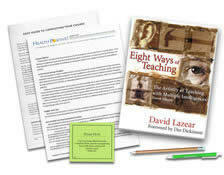 Do you have the Eight Ways of Teaching textbook? See your enrollment options above for "I already own the text". This course introduces teaching practices for 8 forms of multiple intelligences. These include; verbal, mathematical, visual, kinesthetic, rhythmic, interpersonal, intrapersonal and naturalist. It provides insight into the diversity of learning and includes many clearly-designed examples of multiply-intelligent ways to design learning experiences. The textbook was written for teaching children K-12, but the concepts and strategies are clearly applicable to all forms of communication. NOTE: The textbook for this course is the 2003 edition. I enjoyed this course immensely the questions were thought provoking. I began Planning and re-planning lessons right away and put the ideas to work immediately with my 2 year old and the under 5 yr. olds that attend my day care. The book was well written, clear and easy to assimilate. Comprehensive, easy to read, and excellently organized. Useful templates included. This was interesting because I never knew how to combine various exercises to enhance deep learning. I will use what I learned in my massage and wellness classes. I had less than a month to read the book and complete the course to renew my license. Before I took this course, I have thought how utilizing different intelligences into teaching a subject would encapsulate all the different learning abilities of students. This course only reaffirmed that thought. I will definitely break the methods down and integrate them in teaching, as it will open up a whole new world for me and my students. As a massage teacher, I found the topic most enlightening and have been using it for 2 quarters at my institution. My students have really blossomed since I've been using this strategy. The book, "Eight Ways of Teaching" and the test were the course materials. The author, David Lazear, masterfully translates multiple intelligence research/teaching/planning into understanding and eagerness to dive in. I wish there had been a workbook, but after completing the course, I see the book is the workbook. Thank you for this. A similar course was offered 18 years ago to the teaching staff at the massage school where I taught for 10 years. The information was as interesting, applicable, and valuable to me then as it is now. Not only can this information be used in classroom setting, it is also helpful in determining the learning intelligence of clients to best educate them with regard to self-care. Wonderful course! I found the book fascinating. Identify at least three ways of teaching for, with and about multiple intelligences. Recognize the learning tools that are related to at least three intelligence types. Identify the key elements in each of the lesson synopses. List the stages of “Lesson at a Glance” and recognize the importance of each stage. Identify at least two important items that may be included in a student’s portfolio for assessment documentation. Describe the key elements in teaching for, with and about verbal/linguistic intelligence. List at least one portfolio tip and one journal assessment tip for 3 intelligence types. Describe the key elements in teaching for, with and about logical/mathematical intelligence. Identify logical/mathematical strategies for the lesson palette. Describe the key elements in teaching for, with and about visual/spatial intelligence. Which of the following statements is TRUE of bodily/kinesthetic intelligence itself, or in relation to this lesson? This lesson is a process of guessing one another’s emotions through physical movement. There are several abilities that our bodies know that are not necessarily clear to our minds. In this lesson, it is best to loosely model the skills to the students in order to allow their free expression. In this lesson, it is important to have as much content as possible in the demonstration.